I’ve been a little MIA, I admit, but I wanted to post about the things I bought today! 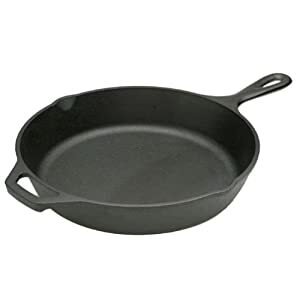 I’ve been hearing about these Lodge Pre-Seasoned Cast Iron Skillets forEVER. I don’t know why I opted against registering for one, but it was finally time to buy. They’re honestly pretty cheap ($25 for 12″, $15 for 10″) and apparently ah-may-zing- read the reviews on Amazon! The 12″ is the “standard”, I think, but I opted to buy the 10 1/4″ because it’s a size that’s more reasonable for me and because they’re really, really heavy pans. The 12″ is EIGHT pounds! The 10 1/4″ is a little more reasonable at 6lbs, so hopefully it’ll do the trick. If I love it enough, maybe I’ll invest in a bigger one later. I’m excited about this because there are a handful of recipes I’ve seen that require/advise the use of a cast iron and so the possibilities abound! Yay new recipes! 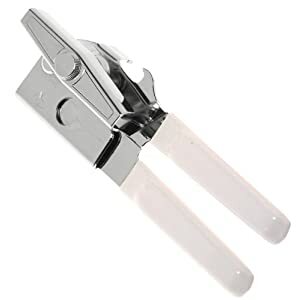 I also bought myself a couple of these Amco can openers. I registered for an electric can opener, which I really like, but figured it would be good and prudent to have a manual can opener around. There was some huge debate in the reviews, though, about how the new ones are made in China and the older awesome ones were made in the US. I’ll let you know if it’s as bad as they make it out to be.